Chaos Software has been making better CRM and PIM applications for micro/small business and individual users since 1992, including the award winning contact relationship manager program Time & Chaos, Chaos Intellect business CRM email software with auto-linked email history for contacts, and Legal Billing time and billing software for attorneys and professionals. Each of these products can utilize shared databases on a network without any expensive server hardware or software requirements. Legal Billing is designed for busy lawyers who need simple time slips, expenses and payments. Intellect is the top-of-the-line with powerful email and contact management. See email history for contacts at a glance! Send personalized messages to groups! Time & Chaos has the same great contacts and calendars as Intellect but without the business email features for users who prefer it lean. See it in action! Be an Expert! 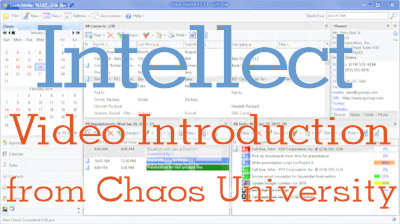 View the full video training for Intellect and Legal Billing in our Chaos University! Every class is 10 minutes or less so you can quickly be an expert! Why not start with our Intellect 101 video to introduce you to our Intellect program? Add Cloud service and work in more places with more devices! Keep your Android or iPhone in sync with your PC, keep PC's at different locations coordinated and even work online from any web browser, including mobile browsers! Learn more at ChaosHost.com and take advantage of a 30 day free trial with our custom cloud service designed exclusively for our Chaos databases used in Intellect, Time & Chaos and Legal Billing! 3/15/2019: Updated versions of our product line of contact manager programs have been released. These include Chaos Intellect (with email), Time & Chaos (without email), and ChaosFree (freeware version of T&C). All of these programs are compatible with Windows 10 as Desktop Apps. Find more information and download them from our Products and Downloads page. Looking for something? Here's our sitemap! Contact Us - for those times where you can't find your answer anywhere! We're happy to help! Our privacy statement - Chaos Software Group, Inc. honors your privacy! Were you expecting someone else? We changed our official company name in July 2003 from iSBiSTER International, Inc. Same people, new name!